I awoke from my nap about 30 minutes ago to check a couple of scoreboards: the Democratic Primary contest between Barack Obama and Hillary Clinton in Pennsylvania and the Western Conference playoff game between the New Orleans Hornets and Dallas Mavericks. The results are still coming in for both but the victories are pretty much decided. Clinton is the projected winner in PA and the Hornets are about to wrap up Game 2 in NO. I thought of Charlotte when I saw these results. With Clinton pulling out a much-needed victory over Obama, not only does she keep her campaign alive but she and Obama now turn their attention to the May 6 Democratic Primary. Well, they'll turn their attention to the next primary after they each spend tonight and tomorrow "spinning" what they believe to be the effects of tonight's results. The May 6 primary features two states: Indiana and North Carolina. And with Charlotte being North Carolina's largest city, we can expect a lot of attention. 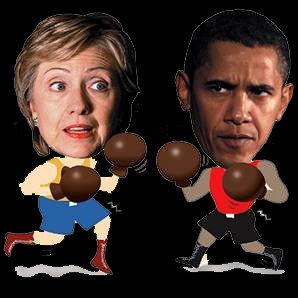 It was announced yesterday that there will be no Clinton-Obama debate in NC, after weeks of trying by the state's Democratic Party. I think not having another debate between those two is a good thing. What else is left for them to say? And I see no benefit other than giving us the chance to see them in person at some venue and for us to act like fans at our favorite hip-hop concert. But Clinton is scheduled to come to Charlotte April 28. With Obama coming off a loss in PA, I now expect him to appear sometime before May 6 as well. They'll each also likely be sending surrogates every few days (read my post from a week and a half ago about Tatyana Ali surrogating for Obama). I also expect Obama to be running TV ads like crazy. I don't expect as many from Hillary, although she needs it since Obama is leading in NC in all polls. But the difference here is that Obama is sitting on a war chest of $42 million, while Clinton's campaign is in debt by $600,000. Yet Obama has outspent Clinton in states before, such as Pennsylvania, only to come out with an L.
Now, for the reason there's "No Eyes On Charlotte" (if you must, scroll back up to the headline of this post). The Hornets are in New Orleans and not Charlotte. Yes, it's been six years since Hornets owner George Shinn fell out of love with the Queen City (a failed arena deal was largely to blame) and took his team to the Big Easy. But even with having the Hornets replaced by the Charlotte Bobcats only two years later, it's still a bitter pill for many Charlotteans. If you don't believe me, just read the reader comments section online on any story The Charlotte Observer does on the Bobcats. In fact, I sometimes spend more time reading the people go at it in the comments section than I do actually reading the article. Read the comments to this recent story on Charlotte.com about the Bobcats being contracted to stay in Charlotte. It's crazy. And I'm convinced it's the same folks commenting every time. Tiger Woods had knee surgery last week and will not be defending his title next week at the Wachovia Championship, which means much fewer people now care about this golf tournament: No Eyes. Both Bank of America and Wachovia have released first quarter figures, revealing huge profit losses and showing how much the mortgage lending crisis is continuing to effect the economy: All Eyes.